After brunching in the clouds last week, Our Ladies needed to get back down to earth, especially after overindulging in the charming American custom that is Thanksgiving. “I don’t even want to look at the word turkey,” Brandy mumbled, “Damn Pilgrims. No wonder the British forced them out.” And so it was decided that they should visit Ann Sather, Chicago’s famous Swedish breakfast bastion, famed for its generous portions and monstrous cinnamon rolls. The Browns once again joined them; Birdie, still half asleep and Biscuit, fresh from her harrowing hangnail surgery. They had their choice of two Ann Sather’s, both within walking distance of each other in the Lakeview neighborhood; one on Broadway and the other on Belmont. They opted for the more spacious Broadway location, hoping to avoid a wait. Their plan worked perfectly as they were taken to a table straight away to be offered water and coffee by an abundance of roaming servers. The décor inside was bright and cheerful enough, but nothing remarkable. 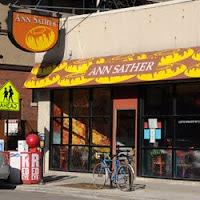 Happily, even though the space was open like so many of the breakfast establishments Our Ladies have visited, Ann Sather had taken care with her table spacing, not forcing patrons to be on top of each other, thus making conversation possible. The best deal on the menu seemed to be the egg dishes, all of which came with two sides. Choices included fruit salad, hash browns, muffins, toast, cottage cheese, and those oh so delicious cinnamon rolls. Accordingly, Bunny ordered the Crab Cake Benedict and Brandy the Garden Variety Omelet, both of them taking hash browns and cinnamon rolls as their trimming. They also ordered beverages; for Bunny an SOB (Strawberry, Orange, Banana juice) and a hot chocolate for Brandy. Birdie asked for the Swedish Breakfast Sampler, a combo platter or Swedish pancakes, Swedish meatballs, Swedish potato sausage, and an egg (it has yet to be confirmed whether the egg was Swedish or not), as well as a side of choice (of course, he asked for the cinnamon rolls). Biscuit broke away from the pack by ordering some Bacon Cheddar Potato Pancakes, which sadly did not off the choice of sides the other dishes did. Biscuit’s potato pancakes were indeed savory and crispy, though with only a dollop of sour cream to accompany them, Biscuit began to wish she had ordered something that came with one of those many sides. “These little darlings just need a nice fruit cup to break them up a bit,” she sighed. Bunny’s Crab Cake Benedict fell a bit short of expectation (as we all know, Bunny is a leading expert in Eggs Benedict). The poached eggs atop the crab cakes were over cooked, with no delectable yoke to run out, and the crab in the crab caked may have been “crab,” or at least previously frozen crab, as it was a tad mushy and fishy tasting. The hash browns proved to be a bit more interesting; they were not a typical hash brown, but something more akin to a home-style potato, having not been shredded or fried on a flat top. Instead, they were rather creamy and well seasoned. Finally, Brandy’s omelet came crammed with fresh veggies like broccoli, tomato, and zucchini. Brandy was heard to comment that all the dish need was a hit of cheese, though she admitted that there’s not many dishes that couldn’t benefit from a hit of cheese. I too am a huge fan of Eggs Benedict and particularly Crabcake Benedict so you will have to tell me where your favorite is! Hey I'm switching away from Typepad shortly and your site doesn't allow for a name/url commenting option which means I won't be able to comment Just FYI. Problem should be fixed, my good woman. Thanks for alerting us! Eggs Benedict for all!